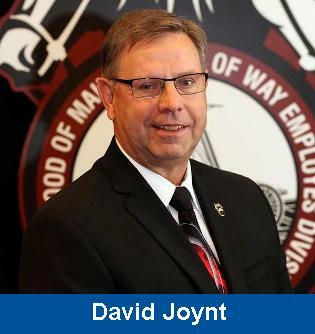 2015 April - June - David Joynt: What does the Union do for me? A Vice President Speaks: What does the Union do for me? Life goes fast, especially — it seems — for a BMWED railroader. With each passing month, the days seem to blur together, and it’s often easy to take some things for granted. Let’s face it — it’s easy to become distracted when you’re busy. I’m proud to be a 40-year member of the BMWED. This is a Union of all of us, brought together in a collective and unified way, to help fight for a more successful future and for an improved quality of life for all BMWED members. With Union membership regretfully down throughout the American workforce, the BMWED is among the last of the viable labor organizations in the United States. Our work lives — and sometimes, by extension — our personal lives, are improved in many ways by being a member of the Union and having the ability to collectively bargain. But once again with the hectic nature of life, we sometimes overlook just how much our lives are affected by being a member of the BMWED. I often hear, at local or other meetings, a member who is frustrated at the moment ask what does the Union do for me? If you really stop and think about it, the answer is a tremendous amount and a whole lot more than one would think before really dwelling on it. We take for granted what we and those who preceded us have fought for and gained through sacrifice and dedication to the cause. With this in mind, here is a “typical” day in the life of a BMWED railroader, and how that day’s events are beneficially influenced by the Union. I like to think of it as a handy, “What does the Union do for Me?” timeline. After you think about it, my list is probably not all-inclusive and you can probably add more items. 7:25 a.m. — You arrive at the yard office, where you gather with the other members of the section gang. You make a quick trip to the bathroom, because you’ve had too much coffee. You wash your hands in the sink, and splash a little water in your face, just to help you wake up. Your reporting location and starting time are negotiated in your Collective Bargaining Agreement (CBA). There are limits on changes that can be made to them. Restrooms are OSHA regulations, which were argued for and obtained through Union lobbying. 7:30 a.m. — By 7:30, everyone has made it in. There’s a service lane traveling tie team in this Monday morning, in town to put in switch ties in the yard. They are staying at the hotel down the street. You recognize three of them from the six months you spent out on an SPG curve patch team in 2013. The traveling gang is being paid a per diem to cover out-of-town expenses, as prescribed by the CBA. Their hotel room is negotiated by the BMWED. They are working four, 10-hour days, as required by the CBA. They arrived to the reporting location in company transportation, also in the CBA. They are also paid a weekend travel allowance that helps pay for their travel home over their rest days. 7:35 a.m. — The roadmaster begins the job briefing, where the work plan and the on-track protection that is going to be used is discussed. Safety rules are read and reiterated, and everyone is informed of what to do in the event of an emergency or a change in working conditions. Your foreman takes this opportunity to inform the roadmaster that the hydraulic spiking hammer has been “red tagged” out-of-service because the trigger is malfunctioning. The roadmaster says to load it into his truck and he will take it in to be repaired. Job briefing and lock-outs of defective equipment are safety measures obtained through legislation of Roadway Worker Protection laws, successfully lobbied for by rail labor unions and spearheaded by the BMWED. negotiated by the union and agreed to in the CBA. 8:30 a.m. — In talking with the guys on the mobile gang, they say they’re going to be in the area for the next three months. They also say the current bid-in backhoe operator is bidding off to go back home. You begin to wonder, “if I bid on the backhoe job, I’ll get mobile gang money and still work near the house...” With 16 years of seniority as a machine operator, you’d stand a pretty good chance of catching the bid. Plus, that machine operator job pays more than your current vehicle operator job on the section. Food for thought... Rates of pay and seniority rules are negotiated by the BMWED and are included in the CBA. The seniority roster and bidding rules allow you to work any job in which you are the most-senior bidder, regardless of what the roadmaster prefers. 11:30 a.m. — Lunch. The gang takes it in to the yard office to wash up and eat lunch. Noontime meal period and wash up time/ facilities are negotiated in your CBA. If not returned to a facility the Company must provide the time, soap and water to wash up before eating. Noon — Tommy Wilson stops into the yard office. He retired from the railroad four months ago, and is just coming by to say hello to the guys. It is good to see him. He looks rested and happy. Five years ago, Tommy went off sick due to a heart attack. He had triple bypass, missed some time, but eventually came back to a flagging foreman job. Everyone likes Tommy — he’s just a good, friendly guy. The guys are enjoying swapping old railroad memories over lunch. Railroad Retirement is legislation lobbied for and obtained by rail labor. It is federal law, and is one of the strongest pensions in the world. Disability, sickness and unemployment benefits are also federal legislation won by rail unions. 12:20 p.m. — You start daydreaming about your upcoming vacation. Tied in with the Fourth of July, you’re going to get a whole 10-days at the beach! That will be a nice break. Paid holidays and paid vacations are negotiated by the BMWED and detailed in the CBA. 1:00 p.m. — The yardmaster calls out over the radio for your foreman. Seems like there’s been a derailment in the south yard, track 2. Sounds as if this work day just got a lot longer. 1:15 p.m. — It appears that the train derailed in the switch. If you had to guess, it might have picked the switch point. The yard inspector is there with the boss, who is looking for someone to blame for the derailment. At least, if there is an investigation, the yard inspector has the backing of his BMWED and the Company must prove the charges against the individual before any discipline can be assessed. In the event of an accident or incident at work, there must be a hearing before discipline is rendered, per the CBA. 7:42 p.m. — Work on the derailment is wrapping up, and here comes the roadmaster with some pizza. Second and subsequent meal periods are negotiated by the BMWED and included in the CBA. 8:03 p.m. — Finally heading home for the day, with 4-1/2 hours overtime. This next check is going to look good, especially since you were called out on Saturday on a hard-to-throw switch. All-in-all, it’s just another day on the railroad. Overtime pay negotiated by the BMWED and agreed to in the CBA. continues to be a strong and influential Union in the railroad industry. The only way we continue to move forward is to be united and unified in our fight against the Companies and the politicians who are receiving the large donations to pass anti-union legislation. So, the next time you hear a member ask “what has the union done for me,” I hope that you will be quick to point out the truth, and that is they have done a lot that affect us almost every hour of every day. Solidarity, Brothers and Sisters, is how we are going to survive and move forward!